—No update: McCarthy didn’t have any further update on the leg injuries that knocked WRs Charles Johnson and Kevin Dorsey out of practice on Saturday. Neither practiced on Sunday. McCarthy did say he’s been told neither injury is serious. In other injury news, CB Tramon Williams was held out towards the end of practice because his knee was bothering him, McCarthy said. —Strong finish on offense: The offense looked sharp in the no-huddle period that ended practice. QB Aaron Rodgers completed deep crossing routes to WRs Randall Cobb and Ross to get in position to score, and then WR Jarrett Boykin hauled in a high fade in the corner of the end zone, outjumping the solid coverage of CB James Nixon for the TD. That was the final play of practice. —Ups and downs: That final play of practice capped an up-and-down day for Nixon, a holdover from last year’s practice squad. Early in the workout, Nixon muffed a kickoff return. Later, he made a nice play breaking up a slant pass to rookie WR Alex Gillett, and then he made his big splash, intercepting a Rodgers pass intended for rookie WR Tyrone Walker. Had he been able to break up that last pass to Boykin, he would have been heralded as the star of the day, despite the early kickoff fumble. —Better hands: Safety Morgan Burnett, who received a multi-year contract extension prior to the start of camp, said he’s already put his payday behind him and he’s working on improving in his fourth season, particularly with his hands. —Familiar face: Former Packers RB Ahman Green is in camp as a coaching intern, working with RB coach Alex Van Pelt. —Active first day: LB Jamari Lattimore missed the first two days of practice with an illness, but he wasted no time getting involved on Sunday. In full pads from the get-go, Lattimore laid a hit on RB Johnathan Franklin that broke up a dumpoff pass in the first team (11-on-11) period of practice. Later, in the half-line drill that pits a portion of the offensive line against a portion of the defense to work on inside runs, Lattimore knocked RB Eddie Lacy to the ground with a big hit from the side. McCarthy said after practice that Lattimore probably “did too much” for his first day, as he was dealing with cramps toward the end of the workout. —Strong push: LB Nick Perry was best as a bull-rusher as a rookie, and there’s no denying his strength. In a blocking drill between OLBs and TEs, Perry got underneath TE Ryan Taylor’s pads and shoved him backwards, drawing a notable cheer from the Ray Nitschke Field crowd. 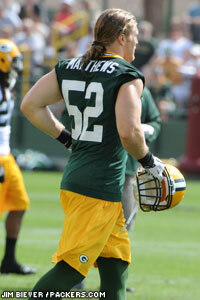 —Doing it all: Never let it be said LB Clay Matthews isn’t a complete player. Known for his tough run defense and pass rush, Matthews on Sunday dropped well off the line of scrimmage into coverage, read the quarterback and then got a hand on a slant pass to WR Jeremy Ross, tipping it just enough to break it up. WR Jordy Nelson, who missed last Sunday’s game with a hamstring injury, was not practicing on Wednesday in the portion of the workout open to reporters. Mike McCarthy will provide an update post-practice. Also not practicing were the two defensive linemen who left Sunday’s game with injuries — Jerel Worthy (concussion) and Mike Neal (ankle), leaving that position a little thin. Other players who have missed recent games also have not yet returned to practice. FB John Kuhn (hamstring), LB Nick Perry (knee) and CB Sam Shields (ankle) remain out for now. Green Bay Packers Head Coach Mike McCarthy said on Monday that the surgery WR Greg Jennings was planning on having on Tuesday in Philadelphia is being delayed due to Hurricane Sandy. Jennings was scheduled to have surgery Tuesday on a torn abdominal muscle that has kept him out of the last four games and five of the last seven. How long Jennings will have to wait for the surgery now isn’t known. The specialist whom Jennings visited last week and who will be performing the surgery is based in Philadelphia, which is among the major eastern cities bracing for the storm’s pending landfall. Also, WR Jordy Nelson is “close” to returning to action, McCarthy said, after missing Sunday’s game with a hamstring injury. Nelson tested the hamstring before the game but was then put on the inactive list. The tricky thing with Nelson is that he hasn’t experienced a hamstring injury before, so the medical staff is in “uncharted territory” with him, according to McCarthy. McCarthy did not comment on the status of other players who missed Sunday’s game due to injuries, including FB John Kuhn (hamstring), LB Nick Perry (knee) and CB Sam Shields (ankle). He said those players will be rehabbing the next couple of days with the hopes that they’ll be allowed to go through testing later this week. LB Clay Matthews spoke to reporters after Saturday’s practice for the first time in training camp, and when asked whether the Packers’ defense would improve in 2012, he basically said the Dom Capers-coordinated unit has no choice. One of the guys brought in, of course, is Nick Perry, who has been with the first unit at outside linebacker opposite Matthews since the day he arrived. When he’s not in the middle of a play or drill, Perry is often seen either chatting with Matthews or position coach Kevin Greene, and Matthews complimented his willingness to learn. Mentoring a younger player is a bit of a new role for Matthews, but he’s embracing it so far. –LB Desmond Bishop admitted he’s a bit frustrated with his recurring calf injury. He’s dealing with it now after having missed three games last season with the same problem. He said he didn’t have a timetable for his return, but he said he’s in no way concerned about this latest problem lasting until the start of the regular season. –Undrafted rookie RB Marc Tyler has changed uniform numbers. Through the spring and the first two days of camp, he was wearing No. 27. On Saturday, he switched to No. 26, which had been S Charlie Peprah’s number. Peprah was released on the eve of camp. Tyler wore No. 26 in college at USC. That was also the number worn by his father, Wendell Tyler, a former Pro Bowl RB for the L.A. Rams and San Francisco 49ers. The Packers got their pass rusher and he’s from USC. 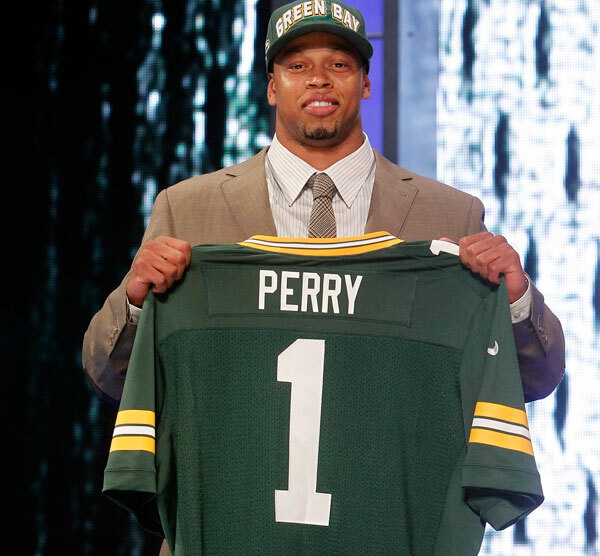 Can Nick Perry do for the Packers’ defense what Clay Matthews did? Perry, a blend of power and speed who lit up the scouting combine, was made the 28th pick of the draft on Thursday night. He immediately addresses the Packers’ desperate need for a pass rusher, following a season in which the Packers were last in the league in sacks per pass play. The Packers selected Matthews out of USC in the 2009 draft and Matthews immediately became one of the pass-rush stars of the league. The hope is that Perry’s presence will help take the focus of offenses off Matthews and allow him to get back to his pass-rush form of 2010. Perry led the Pac-12 in sacks last year with 9 1/2, and he had 21 1/2 sacks total in his three playing seasons. An early entry in the draft, Perry redshirted as a freshman in 2008. As a redshirt freshman in ’09, Perry led USC in sacks with eight. A native of Detroit, Perry is listed at 6-2 1/2, 271 pounds. Packers.com will update this story shortly.